“There is salvation in no one else, for there is no other name under heaven given among men by which we must be saved” Acts 4:12. The Hebrew root hyh gives Ehyeh, “I AM,” when God is speaking, and YHWH, “HE IS,” when we speak of God. In Jewish law since the time of Adam the power to name someone or something expressed dominion over it. God gave Moses his name in the first person singular, Ehyeh, so that he alone could pronounce it. Moses had to give God’s name in the third person singular, YHWH, which did not imply power over him. JPS leaves it in the original Hebrew because English requires a tense such as past, present or future, but Biblical Hebrew at times seems not to have a past, present or future. They can often be inferred from context but are not definitive. Hebrew has an imperfect tense, incomplete now and with no definite completion, and a perfect tense, complete now or will definitely be complete in the future. God’s use of the Hebrew imperfect tense, Ehyeh, tells us that his life is eternal, with no end-point. The Hebrew root hyh gives Ehyeh, “I AM,” when God is speaking, and YHWH, “HE IS,” when we speak of God. In Hebrew, a root consists of three letters common to related words. When transliterating, we occasionally need four English letters; for instance, the Hebrew letter khet is transliterated as kh, the tzade as tz, the shin as sh, etc. Where these are combined we may even need five English letters, as in mshkh, mem-shin-khet.) A root can be a word, as in amen (alef-mem-nun), rosh (alef-raish-yod), shma (shin-mem-ayin), etc., or just a three-letter sequence that holds together other related words. He expected us to speak his name with reverence. “You shall not take the name of the Lord [YHWH] your God [Elohekha] in vain; for the Lord [YHWH] will not hold him guiltless who takes his name in vain” Ex 20:7. He told Moses, “Say to the people of Israel, Whoever curses his God shall bear his sin. He who blasphemes the name of the Lord shall be put to death; all the congregation shall stone him” Lev 24:15–16. But He did expect even laymen to speak his name to one another. Mishna Berakhot 9:5 tells us, “And they ordained that an individual should greet his fellow with [God’s] name.” It was that way in ancient times. “And the angel of the Lord appeared to [Gideon] and said to him, ‘The Lord is with you, you mighty man of valor’” Jdg 6:12. “And behold, Boaz came from Bethlehem; and he said to the reapers, ‘The Lord be with you!’ And they answered, ‘The Lord bless you’” Ruth 2:4. At the time of Second Isaiah, God still said, “I am the Lord [YHWH], that is my name” Is 42:8. But, as the Israelites’ spiritual level continued to fall, the rabbis, careful to avoid blaspheming the Lord’s name, gradually began to limit its use. By the time of Rabbi Yeshua, Jewish law prohibited pronunciation of his name outside the Temple.4 Even Rabbi Yeshua did not speak his name when any human person could hear, but referred to him as Aba, Father. We Catholics do the same in liturgical uses. The Congregation for Divine Worship and the Discipline of the Sacraments, in its Letter to the Bishops Conferences on the Name of God June 29, 2008, prohibits Catholic use of the Hebrew name of God, represented by the Tetragrammaton, in the liturgy. We correctly pronounce YHWH as Adonai. In the Jewish tradition, YHWH reflects God’s mercy, Elohim. his justice and order. At the first moment of Creation we encounter him as Elohim Gen 1:1 because the natural world reflects his order. But he reveals his mercy, preparing to release his people Israel from Egypt, as Ehyeh (YHWH) Gen 3:14 at the burning bush. The difference is not only in the ways we know God, but also in the levels of revelation. YHWH is a more high and pure knowledge of God than Elohim, which is used for both God and idols. “You shall have no other gods [elohim] before me” Ex 20:3; Deut 5:7. God told Moses that even the patriarchs did not know him as YHWH. “I appeared to Abraham, to Isaac, and to Jacob, as God Almighty [El Shadai], but by my name the Lord [YHWH] I did not make myself known to them” Ex 6:3. God revealed much more of himself to Moses. Hear my words: If there is a prophet among you, I the Lord make myself known to him in a vision, I speak with him in a dream. Not so with my servant Moses; he is entrusted with all my house. With him I speak mouth to mouth, clearly, and not in dark speech; and he beholds the form of the Lord Num 12:6–8. For his part, Moses, in direct speech, invariably addresses God as YHWH, never as Elohim. Even so, when Moses asked to see his glory, our Father replied, “You cannot see my face; for man shall not see me and live” Ex 33:20. The super brilliant light of his perfection fully illuminating even our smallest sins would be more than we could bear. Yet we find many references to YHWH in the time of the patriarchs. “But Abram said, ‘O Lord [YHWH] GOD, what wilt thou give me, for I continue childless’” Gen 15:2. “And he said to him, ‘I am the Lord [YHWH] who brought you from Ur of the Chaldeans’” Gen 15:7. Even Abraham’s servant says, “O Lord [YHWH], God of my master Abraham” Gen 24:12. And so on. Rashi observes in his commentary on Exodus 6:3 that the Hebrew verb for “make myself known” was the passive nodati rather than the active hodati. These Hebrew words nodati and hodati come from the root yda, knowledge. The Lord’s lo nodati, “I did not make myself known to them,” is a rare passive usage, suggesting that he chose it carefully to indicate that his revelation to the patriarchs was more passive, at a lower level. Our Father’s love for his covenant family continues across the centuries. From Adam to Noah to Abraham, Isaac, Jacob, Joseph, and Moses, through the years of the Judges, through the monarchic years, through the civil war that split the Holy Land into Judah and Israel, through the Babylonian Exile, through the Hellenic years, through the Maccabean Revolt and the Roman conquest, he forgave “seventy times seven” Mt 18:22 times. Our heavenly Father sent his prophets from the time of the divided kingdom to the post-exile, and after that the sages, to call the Jews back to their covenant with him. Rabbi Yeshua also referred to his divine Father as Aba, Father. Jews also refer to the Father as Avinu Malkenu, Our Father, our King. Isaiah wrote, “Behold, your salvation [yeshua] comes” Is 62:11. In Hebrew, Yeshua means “salvation.” In Greek, the language of the Gospels, Iesous. In Latin, the language of the Church, Iesus. In English, Jesus. This Hebrew word, yeshua, “salvation,” from the root ysha, is pronounced yeshuA. As a name, in Hebrew it is pronounced yeshUa. In Aramaic it is YESHua. In all of these, yeshua is spelled in Hebrew yod-shin-vav-ayin. During his incarnate life YESHua was the name he used every day. Today we use his Greek name because our earliest texts of Rabbi Matityahu, Rabbi Marcus, Rabbi Lucas, and Rabbi Yokhanan are in Greek. Yeshua literally means only “salvation.” Yehoshua, the Hebrew name of Joshua son of Nun, meant “God saves,” foreshadowing Rabbi Yeshua. Yehoshua is pronounced ye-ho-SHU-a, with the accent on the third syllable. The ho, God, is absent from Rabbi Yeshua’s name because he IS. “I and the Father are one” Jn 10:30. But we may understand Yeshua as “God saves” because God alone offers salvation. That name has power. Scripture tells us: “There is salvation in no one else, for there is no other name under heaven given among men by which we must be saved” Acts 4:12. “Therefore God has highly exalted him and bestowed on him the name which is above every name, at the name of Jesus every knee should bow, in heaven and on earth and under the earth, and every tongue confess that Jesus Christ is Lord, to the glory of God the Father” Phil 2:9–11. It is also a prayer. Pronouncing it we proclaim, “God saves!” Rabbi Yeshua told us, “Whatever you ask in my name, I will do it, that the Father may be glorified in the Son” Jn 14:13. Our Father told Abram, “Your name shall be Abraham, for I have made you the father of a multitude of nations” Gen 17:5. He told Jacob, “Your name shall … be … Israel, for you have striven with God and with men, and have prevailed” Gen 32:28. The Son told Shimeon, “You are Peter, and on this rock I will build my church” Mt 16:18. The Church has a Latin motto, in nomen omen, “in name there is meaning.” That is why God changed the names of people when their relationship to him changed, and why he changed the name of his continuing revelation to man when it was completed by the Messiah. The Father’s name, Ehyeh, “I AM,” vividly indicated his presence and power. The Son’s name, Yeshua, was his mission, the salvation of men. Asking for something in Rabbi Yeshua’s name does not simply mean using the words “in Jesus’ name.” It means becoming Rabbi Yeshua’s mirror image, perfectly reflecting his will for us. At Rabbi Yeshua’s bet din, trial, when Caiaphas asked, “Are you the Christ, the Son of the Blessed” Mk 14:61, Rabbi Yeshua answered Ehyeh, I AM Mk 14:62. We can see Rabbi Yeshua ’s bold Ehyeh in Rabbi Marcus‘ Greek translation, Ego eimi, I AM. Rabbi Matityahu quotes from Isaiah’s great prophecy of the Messiah. “Behold, a young woman shall conceive and bear a son, and his name shall be called Emmanu-el” Is 7:14. Sometimes people ask why the promised Messiah was named Yeshua rather than Immanuel. Immanuel means “God with us,” an image of Eden, here in this life. Yeshua, Salvation, is, “Us with God,” an image of heaven. His identity and mission, opening heaven, bring us to live with God in the life to come. Rabbi Yeshua was often called the Mashiakh, Hebrew for “the Anointed One sent to us.” Christos in Greek, Christ in English. Anointed. And so, he arrived as the Son of David, combining the offices of priest, prophet and king. In the Gospels he was ha-Mashiakh, the Christ, the Anointed. Priests were always anointed. “The holy garments of Aaron shall be for his sons after him, to be anointed in them and ordained in them.” Ex 29:29. “…if it is the anointed priest who sins …” Lev 4:3. Prophets were anointed. “The Spirit of the Lord GOD is upon me, because the Lord has anointed me to bring good tidings to the afflicted” Is 61:1. Kings were anointed. “Then Samuel took a vial of oil and poured it on his head, and kissed him and said, ‘Has not the Lord anointed you to be prince over his people Israel?’” 1 Sam 10:1. “He said to his men, ‘The Lord forbid that I should do this thing to my lord, the Lord’s anointed, to put forth my hand against him, seeing he is the Lord‘s anointed’” 1 Sam 24:6. Rabbi Matityahu, Rabbi Marcus, Rabbi Lucas, and Rabbi Yokhanan in their original koine Greek Gospels, generally included the definite article, ho Christos, the Christ. Rabbi Paul, who wrote mostly for the Greeks and Romans, dropped the definite article ho and instead wrote interchangeably of “Jesus Christ” and “Christ Jesus.” The Greeks and Romans of that time did not understand what it meant to be anointed. They substituted chrestos, excellent, for christos, anointed. Rabbi Kefa alluded to this usage when he wrote, ei egeusasthe hoti chrestos ho Kyrios. “for you have tasted the kindness of the Lord” 1 Pet 2:3. By making Christos part of Rabbi Yeshua’s name, Rabbi Paul introduced the sense of an anointed one to millions of Gentile Christians who did not know the Old Testament. The Third Person of the Blessed Trinity is Ruakh haKodesh, the Holy Spirit. We find him in the Tanakh usually as Ruakh Elohim or Ruakh Adonai, Spirit of God, but always in the New Testament as Ruakh haKodesh, Holy Spirit. The Gospels are the crown jewels of the Catholic Bible, so Catholics always refer to him in Hebrew as Ruakh haKodesh. The King James Version uses Holy Ghost, but that is simply how Christians in the 1600s referred to the Third Person of the Holy Trinity. Today we call him the Holy Spirit, a more accurate translation of Ruakh haKodesh. In our time the word ghost has taken on the meaning of an evil spirit, contacted through necromancy Deut 18:10-11. The Latin Mass’ Spiritus Sancti, Holy Spirit, from the Latin spiritus, breath, is not freighted by evil overtones. Spirit refers to a non-corporeal being, and is a more accurate translation of the Latin Vulgate’s Spiritu Sancto Lk 4:1. Either way, the Holy Spirit is always Ruakh haKodesh. The sign on the workshop of creation might have read, “God and Son.” Rabbi Yeshua was present with the Father at the creation. Ages ago I was set up, at the first, before the beginning of the earth. When there were no depths I was brought forth.… When he established the heavens, I was there … when he marked out the foundations of the earth, then I was beside him, like a master workman” Prov 8:23–30. In the beginning was the Word, and the Word was with God, and the Word was God. He was in the beginning with God; all things were made through him, and without him was not anything made that was made Jn 1:1–3. “Glory to God in the highest!” Lk 2:14. When we look up at the sky we see the sun give light, which reminds us of the Son Jn 8:12. And we see the moon reflect the sun’s light onto the earth, reminding us of the Blessed Virgin Mary. And when we look at the earth we see trees. Each tree reminds us that Rabbi Yeshua is the root that nourishes the whole tree. Then we see the trunk, which reminds us of the Vicar of Christ, the Successor of Kefa, the Holy Father who conveys Rabbi Yeshua’s nourishment to all of us. Then we notice the great branches, successors of the shlikhim, which remind us of the diocesan bishops, each the vicar of Rabbi Yeshua for his diocese. And, from them, the smaller branches, reminding us of the priests and deacons. We see the leaves, which remind us of ourselves, the laity, receiving constant nourishment from the root through the trunk and branches, alive only as long as we remain attached. Tree leaves, like most plants, contain green chlorophyll in such abundance that it masks the other pigments. But in autumn the tree receives less sunlight and produces less chlorophyll. As each leaf’s chlorophyll naturally deteriorates and is not replaced the other colors that were there all the time become visible, especially yellow, gold and orange but also red and other colors. Each leaf has its own beauty, but the beauty of autumn in the countryside comes from the symphony of millions of leaves together. God made this great annual pageant to remind us that if we become spiritually beautiful before we fall to earth we will find resurrection. “But thou hast arranged all things by measure and number and weight” Wis 11:20. God’s vast design reminds us how limited our own perceptions are. Hamlet declared, “There are more things in heaven and on earth, Horatio, than are dreamt of in your philosophy.”6 We need God to teach us who we are, where we live now, and where we can live someday. In the beginning God created the heavens and the earth. The earth was without form and void, and darkness was upon the face of the deep; and the Spirit of God was moving over the face of the waters. And God said, “Let there be light”; and there was light. And God saw that the light was good; and God separated the light from the darkness. God called the light Day, and the darkness he called Night. And there was evening and there was morning, one day Gen 1:1–5. “God made the firmament and separated the waters which were under the firmament from the waters which were above the firmament” Gen 1:7. The Hebrew word for heaven, shamayim, literally means “water there,” from sham, there, and mayim, water. God’s original image of water above the firmament, “Water there,” and water below the firmament, “water here,” prepared us for Rabbi Yeshua’s phrase mayim khayim, living waters Jn 4:10–11; 7:38; Rev 7:17, life in heaven. The ancient rabbis believed that the sky was a vast solid dome dividing the upper or celestial waters from the lower or terrestrial waters. The original Hebrew is raquiya, expanse, something beaten or hammered out and thus extended. In the Septuagint’s Greek, stereoma, something made firm or solid. In the Latin Vulgate, firmamentum. The rabbis’ sense that it was solid came from Elihu’s question to Job: “Can you, like him, spread out the skies, hard as a molten mirror?” Job 37:18. God created the angels as spiritual persons, living witnesses to his creation of the material universe, to know, love, and serve him. Genesis does not directly record that God created the angels. It says only, “In the beginning God created the heavens and the earth Gen 1:1. God’s first recorded words of the Creation were, “Let there be light” Gen 1:3. Rabbi Yeshua, the light of the world Jn 8:12, had existence from all eternity, but God created holy angels to reflect Rabbi Yeshua’s light back to him, to one another, and to all the world. The Psalmist says, “Let [all his angels] praise the name of the LORD! For he commanded and they were created” Ps 148:5. God created the angels as spiritual persons, living witnesses to His creation of the material universe, to know, love, and serve him. This was on the first day of Creation. Also on the first day, God separated the light from the darkness. The Church’s tradition is that this was the war in heaven. The sun and moon and stars were made on the fourth day. God is “much superior to angels.” But man is “lower than the angels.” Angel are below God because they belong to the order of created nature, but above man in the order of created nature because they are pure spirit. Man is both spirit and flesh. In Catholic Sacred Tradition, there are three great ranks of angels. Each rank consists of three choirs of angels; nine choirs in all. Scripture identifies the nine choirs: seraphs Is 6:2, cherubs Gen 3:24, thrones Col 1:16, dominions Col 1:16, virtues Eph 1:21, powers Eph 1:21, principalities Rom 8:38, archangels Jude 9, and angels Mt 28:2. Sometimes, angel Ps 148:2 is used to describe all of the angelic choirs. Nearest to God are the seraphs, the cherubs, and the thrones. Their entire existence is glorifying, loving and praising God. They have such an intense relationship with God that they let nothing interfere with their adoration. Second are the dominions, virtues, and powers, which receive divine mysteries from the highest rank and teach them to the lowest. The third rank, nearest to us, are the principalities, archangels, and angels, which protect nations, cities, and churches as well as individuals. Angels are real persons of pure spirit, so different from one another that each angel is said to be its own species. Angels are far more alert, aware, and intelligent than we are; they have no need of sense data. With a single act of their intellect they are able to penetrate the essences of things and the uniqueness of things. Angels learn from divine revelation: “that through the Church the manifold wisdom of God might now be made known to the principalities and powers in the heavenly places” Eph 3:10. Angels can also receive understanding from higher order angels. An angel, once decided on a course of action, never draws back or doubts because his decision always involves a full act of his will. Therefore, the angel uses all of his awesome power to accomplish his mission. When God supported King Hezekiah of Judah against King Sennacherib of Assyria, an angel of the Lord went forth and struck down 185,000 Assyrian soldiers in a single night 2 Kings 19:35; Is 37:36. Angels are finite beings, and so cannot perform miracles. A miracle is something done by God outside the order of created nature. God of course can work miracles through angels. However, angels’ natural power and swiftness can accomplish what look like miracles to us. St. Michael, the great warrior archangel who defeated Lucifer, is prince of the heavenly host and the guardian angel for God’s people Israel and for his new Israel. “At that time shall arise Michael, the great prince [sar] who has charge of your people” Dan 12:1. This word sar gives us the Hebrew word saraf, plural srafim. In 1611, before the English language spread worldwide, England’s King James Bible translation rendered it “seraph.” In Hebrew, Michael is pronounced mi-kha-el. Mi who, kha like, el (short for Elohim) God. Who is like God, a rhetorical question that means there is no one like God. St. Gabriel told Zechariah: “I am Gabriel, who stand in the presence of God” Lk 1:19. We know St. Gabriel particularly by his revelations of Rabbi Yeshua. He told Daniel in veiled prophecy: “Seventy weeks of years are decreed concerning your people and your holy city, to finish the transgression, to put an end to sin, and to atone for iniquity, to bring in everlasting righteousness, to seal both vision and prophet, and to anoint a most holy place” Dan 9:24. And he asked the Blessed Virgin Mary whether she would consent to be the mother of the Son of God: “And behold, you will conceive in your womb and bear a son, and you shall call his name Jesus. He will be great, and will be called the Son of the Most High; and the Lord God will give to him the throne of his father David, and he will reign over the house of Jacob for ever; and of his kingdom there will be no end” Lk 1:31–33. In Hebrew, Gabriel is pronounced ga-vri-el. The Hebrew root for gvura, courage, is gbr. El (short for Elohim) is God. God is my Hero. § 328 The existence of the spiritual, non-corporeal beings that Sacred Scripture usually calls “angels” is a truth of faith. The witness of Scripture is as clear as the unanimity of Tradition. § 329 St. Augustine says: “‘Angel’ is the name of their office, not of their nature. If you seek the name of their nature, it is ‘spirit’; if you seek the name of their office, it is ‘angel’: from what they are, ‘spirit’, from what they do, ‘angel. '” With their whole beings the angels are servants and messengers of God. Because they “always behold the face of my Father who is in heaven” they are the mighty ones who do his word, hearkening to the voice of his word. § 330 As purely spiritual creatures angels have intelligence and will: they are personal and immortal creatures, surpassing in perfection all visible creatures, as the splendor of their glory bears witness. § 331 Christ is the centre of the angelic world. They are his angels: “When the Son of man comes in his glory, and all the angels with him …” Mt 25:31. They belong to him because they were created through and for him: for in him all things were created in heaven and on earth, visible and invisible, whether thrones or dominions or principalities or authorities – all things were created through him and for him. They belong to him still more because he has made them messengers of his saving plan: Are they not all ministering spirits sent forth to serve, for the sake of those who are to obtain salvation? § 332 Angels have been present since creation and throughout the history of salvation, announcing this salvation from afar or near and serving the accomplishment of the divine plan: they closed the earthly paradise; protected Lot; saved Hagar and her child; stayed Abraham’s hand; communicated the law by their ministry; led the People of God; announced births and callings; and assisted the prophets, just to cite a few examples. Finally, the angel Gabriel announced the birth of the Precursor and that of Jesus himself. § 333 From the Incarnation to the Ascension, the life of the Word incarnate is surrounded by the adoration and service of angels. When God brings the firstborn into the world, he says: “Let all God‘s angels worship him.” Their song of praise at the birth of Christ has not ceased resounding in the Church’s praise: “Glory to God in the highest!” They protect Jesus in his infancy, serve him in the desert, strengthen him in his agony in the garden, when he could have been saved by them from the hands of his enemies as Israel had been. Again, it is the angels who evangelize by proclaiming the Good News of Christ’s Incarnation and Resurrection. They will be present at Christ’s return, which they will announce, to serve at his judgement. § 334 In the meantime, the whole life of the Church benefits from the mysterious and powerful help of angels. § 335 In her liturgy, the Church joins with the angels to adore the thrice-holy God. She invokes their assistance (in the Roman Canon’s Supplices te rogamus … [“Almighty God, we pray that your angel…”]; in the funeral liturgy’s In Paradisum deducant te angeli … “May the angels lead you into Paradise …”). Moreover, in the “Cherubic Hymn” of the Byzantine Liturgy, she celebrates the memory of certain angels more particularly (St. Michael, St. Gabriel, St. Raphael, and the guardian angels). § 336 From infancy to death human life is surrounded by their watchful care and intercession. 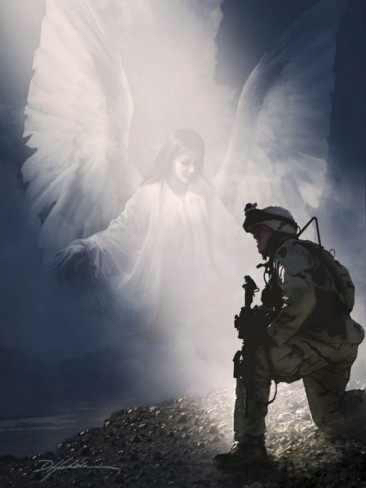 Beside each believer stands an angel as protector and shepherd leading him to life. Already here on earth the Christian life shares by faith in the blessed company of angels and men united in God. Holy Mother Church teaches the existence of angels at the highest level of theological certainty. It is dogmatic doctrine that God assigns a guardian angel to each baptized Christian. Some well-meaning Catholics try to name their guardian angels, but Catholic teaching is that we do not name them. We can name only those whom we have authority to name. They are Rabbi Yeshua ’s angels with authority over us! In all Scripture, only one angel ever treated a human with deference Lk 1:28. God revealed his great rule for us first to the angels. The Shma, the summary of all the Torah, which existed in God’s mind before the Creation, proclaimed it: “You shall love the Lord your God with all your heart, and with all your soul, and with all your might” Deut 6:5. Rabbi Yeshua re-stated, “You shall love the Lord your God with all your heart, and with all your soul, and with all your mind. This is the great and first commandment” Mt 22:37–38. By tradition, God told the angels that he would empty himself Phil 2:7 of the open manifestation of his divinity and live as a man for a short time, and would crown his earthly mother, Mary, queen of heaven over all the angels and saints. To attain supernatural beatitude, the angels would have to empty themselves and be filled with the glory of God. They would have to be humble, serving humans, creatures lower than themselves, to complete the mission that God had set for them. God radiates light. His creatures shine by reflecting his light. Before the war in heaven the brightest seraph of all was Lucifer (Latin: light-bearer), prince of the heavenly host. Lucifer is traditionally represented with horns symbolizing his authority over the angels as first prince of the heavenly host. His name Lucifer came from the Latin fer lucis, “bearer of light.” Isaiah’s vision of the war in heaven called him in Hebrew heilel ben shakhar, “Shining one, son of dawn” Is 14:12, comparing him to a star so bright it could be seen even at sunrise. But Lucifer, puffed up with pride, said, “I will make myself like the Most High” Is 14:14,10 that his authority over the angels would extend to everything God created, and a third of the angels followed him. Rabbi Yeshua did not fully reveal his redemptive Final Sacrifice until he came into the world. Lucifer therefore could not understand why Rabbi Yeshua would take human form, or why Mary, a human, would be crowned queen of heaven over him. Rather than trust Rabbi Yeshua, he decided to replace Rabbi Yeshua ’s judgment with his own judgment. St. Thomas Aquinas told us that Lucifer, in his pride, did not know that he would lose the war against God.11 An angel’s intellect, though vastly superior to the intellect of any human being, is nonetheless finite, and therefore cannot fully comprehend the plans of God.12 Lucifer wanted to attain by his own finite nature and intuitions what can be attained only through God’s infinite grace by a loving trust in his way. God’s light shines on all his creatures. As God’s image and likeness, our obedience reflects his light back to him and to one another. St. Thomas is known as the Angelic Doctor for his insights into the angels, so Catholics accept his conclusion that Satan did not know he would lose the war in heaven. It is permissible for a Christian to believe that Lucifer knew he would lose. John Milton’s epic poem Paradise Lost offers a colorful account in which the fallen angels discussed how they might escape hell and recover some of their former glory. Satan had said it was better to reign in hell than serve in heaven, and the other fallen angels, too proud to consider seeking re-admittance through contrition, agreed. Beelzebub, second in command, proposed that they could take possession of the earth and subdue men as slaves. Milton’s Satan is more colorfully drawn than his bland God, to show that evil is often superficially more attractive than virtue. However, Milton was not a Catholic, and Paradise Lost is imaginative rather than historical. The Revelation tells us: “Now war arose in heaven, Michael and his angels fighting against the dragon; and the dragon and his angels fought, but they were defeated and there was no longer any place for them in heaven. And the great dragon was thrown down, that ancient serpent, who is called the Devil and Satan, the deceiver of the whole world – he was thrown down to the earth, and his angels were thrown down with him” Rev 12:7–9. Because Michael fought under Rabbi Yeshua’s authority he prevailed. St. Jude told us that St. Michael, reflecting God’s glory, was humble: “But when the archangel Michael, contending with the devil, disputed about the body of Moses, he did not presume to pronounce a reviling judgment upon him, but said, ‘The Lord rebuke you’” Jude 9, no doubt recalling Zechariah, Zech 3:2. Lucifer imagined that he was like God, that his authority over the angels would extend to everything God created. When Lucifer became disobedient his intense light became intense darkness. With his defiant Non serviam (Latin: I will not serve), Lucifer closed his heart and mind to God, and a third of all the angels in heaven followed him. When he closed his heart he no longer reflected God’s light and became dark. “And God saw that the light was good; and God separated the light from the darkness” Gen 1:4. God had made the angels good. He separated the angels of light from the angels of darkness by kicking the dark angels out of heaven forever. St. Augustine emphasizes that the dark angels were evil, “not of nature, but of will.”13 God had made the angels good, but they themselves willed to become evil. Lucifer with his rebellious angels fell from heaven. Isaiah observed: “How are you fallen from heaven, O Day Star, son of Dawn” Is 14:12. When Lucifer fell from heaven he lost his brightness and instead took on a love of self that became dark seething hatred for all else. Rabbi Yeshua changed his name to satan Lk 10:18, a Hebrew word meaning accuser or adversary. In Jewish tradition, when God judges a man, the satan calls out the evil things he has done. Satan and his fallen angels lost God’s friendship forever. Their natural intellect and power were turned to evil purposes. Satan’s fall from heaven brought hell into existence. Rabbi Kefa wrote, “God did not spare the angels when they sinned, but cast them into hell,” 2 Pet 2:4 where love of self replaces love for God. The fallen angels lost paradise for one mortal sin, pride, the primary sin from which all others flow. The fallen angels, now called demons, could no longer attack God. They continued their war against God on earth by attacking his image and likeness Gen 1:26–27. “Then the dragon was angry with the woman and went off to make war on the rest of her offspring, on those who keep the commandments of God and bear testimony to Jesus” Rev 12:17. They know they have lost heaven through their own fault and are filled with fury and bitter hatred. It is a sinat khinam, a hatred without cause. Our Father had merely given them what they wanted, as indicated by their actions. The demons hate one another. Like the worldly people who use one another to obtain power, or the man and woman who use one another to obtain pleasure, the demons use one another to take human souls, but they also constantly hate and tear at one another. Like holy angels, demons are so different from one another that St. Thomas says each one is its own species.14 Some are smarter than others. Some are more tenacious than others. Some are emotional while others are coolly logical. But all are real, living, powerful, and implacably hostile spiritual persons filled with dark seething hatred, bent on destroying us. When God created the heavens and the earth, “The Spirit of God was moving over the face of the waters” Gen 1:2. Water and the Spirit came together in the Creation. Rabbi Yeshua told us, “Truly, truly, I say to you, unless one is born anew [Greek: anothen, from above], he cannot see the kingdom of God” Jn 3:3. Science has shown us the harmony within the created universe. Ruakh haKodesh, the Holy Spirit, shows us the harmony between the created universe and man. Our Father designed spiritual teaching and comfort for his children into his material universe. The sun emits light. The moon can only shine by reflecting sunlight. In this our Father reminds us that God is the source of all light. We, his creatures, can shine only by reflecting his light back to him and to one another. If we are obedient to him we will reflect much of his light and shine brightly before God and man on earth and in heaven. Rabbi Paul assured us, “For since we believe that Jesus died and rose again, even so, through Jesus, God will bring with him those who have fallen asleep” 1 Thes 4:14. Each evening the sky gets dark and we go to sleep, a rehearsal for the day when we actually pass into eternity. Every morning the sun rises and we awaken, reassuring the faithful that they will have their own resurrection to eternal life. When the time comes for our final earthly sleep, we can go to it in peace and serenity. And, at night, we can look up at the clear sky and see millions of stars. Our Father told Abram, “Look toward heaven, and number the stars, if you are able to number them” Gen 15:5. Then he said to him, “So shall your descendants be” Gen 15:5. He repeated his promise to Abraham Gen 22:17, and recalled it to Isaac Gen 26:4. 1 JPS Tanakh. Jewish Publication Society and ArtScroll translators are native Hebrew speakers. An educated native speaker generally will understand the subtleties of a language better than an equally educated speaker who has studied it only as an adult. For convenient reference by Catholic and sola Scriptura users, Second Exodus uses the RSV2CE but often consults the Tanakh for further clarity. 3 Jeffrey H. Tigay, JPS Torah Commentary on Deuteronomy (Philadelphia: Jewish Publication Society, 1996), Excursus 4, p. 431. 4 Babylonian Talmud, Pesahim 50a. Also, Josephus, Antiquities of the Jews, Book II, Chapter 12, section 4. 5 Canon Michael Lewis’ book, Hallowed Be Thy Name: Reflections on the Divine Name in Sacred Scripture (Oxford: Family Publications, 2001), p. 35, is the best available Catholic source on this subject. 6 Shakespeare, Hamlet, Act I Scene 5. 7 St. Augustine, Confessions, Book I, Chapter 1. 8 St. Thomas Aquinas, Summa Theologica, I.62.2. Explanations of natural and supernatural beatitude from Father John A. Hardon, S.J., Modern Catholic Dictionary (Bardstown, KY: Eternal Life, 1999) p. 58. 9 Summa Theologica, I.62.5. Each angel, according to his own freedom, chose to accept or to reject God’s gift of supernatural beatitude. 10 St. Thomas Aquinas, Summa Theologica I.63.3. 11 St. Thomas Aquinas, Summa Theologica I.57.3.R2. 12 St. Thomas Aquinas, Summa Theologica I.58.5. 13 St. Augustine, City of God, Book 11, Chapter 19. 14 St. Thomas Aquinas, Summa Theologica I.50.4.